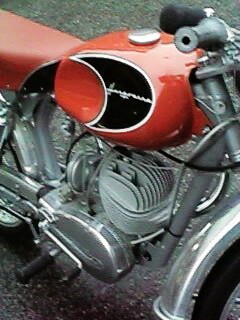 This Silverpilen 282E was a revised 282 with a new style gastank introduced late in 1958 . Also featured was a new seat coverstyle that expanded the red saddle area. 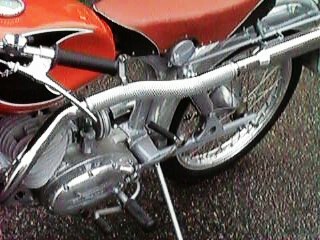 The Silverpilen was made as lite as possible by using alloy pieces where possible - horn, fenders, chain guard, and heat shield were some of the items. 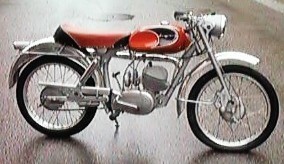 The black and red paint scheme made for a racing look and this model Husqvarna was the most popular motorcycle with Swedish teenagers from 1955 thru 1965. 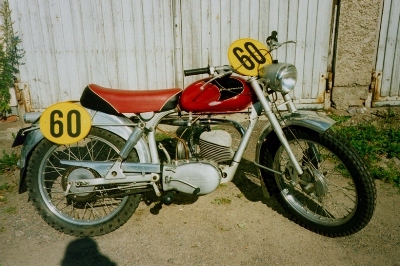 The basic Siverpilen is known as a model 282 and began production in 1955. These Silverpilen were modified for motocross by privateers for years prior to a factory racer 250cc issued in 1963. The model you see here is Rolf Tibblin's 250 Silverpilen that was a EM champion motocross machine in 1959. Many modifications were made to get the bike to this point. New rear sub frame was made to accomodate Girling shocks and the framgaffel (front forks) was modified to fit matching Girlings. A new cylinder/head has been fitted with more cooling fins on both to allow for size increase from 175 to 250cc. The avgasrör (exhuast) is a dual chamber as the cylinder is a two port exhuast. There is a strengthening member added under the engine. The carb is upgraded to a 32mm Bing. A simple way to get your Silverpilen in an enduro was to put nummerplåts on and go for it as shown here on a nice 282E . In fact this particular model looks like only trials type däck (tyres) , motocross styrstång (handlebars), and nummerplåts have been added.